Updated 2015: Cox and Robinson Ltd on Olney's Market Place is the dispensing chemist for Olney. It offers a private area for discussions with the pharmacist and screening. It is possible for prescriptions to be sent down from Cobbs Garden Surgery on request. 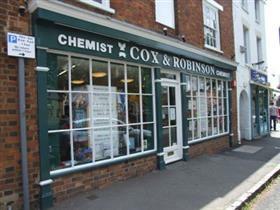 As well as the full range of over the counter medicines, Cox and Robinson Olney also offers a private area for discussions with the pharmacist. The shop sells a wide range of make-up, toiletries and baby supplies.